Nowhere is sleeping around a more frustrating pleasure than on the Riviera Maya, a destination that runs from about 22 miles south of Cancun through the town of Punta Allen along the Caribbean coast of Mexico. 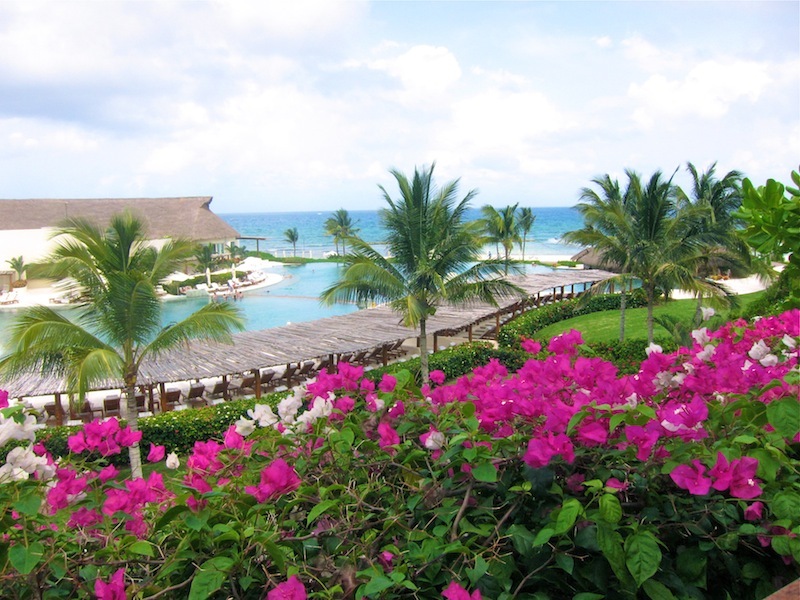 The Riviera Maya is jam-packed with fabulous resorts. I wanted to try them all, and at the same time, wanted to settle into each for long and lingering stays. The dual desires landed me in two lush, plush beds. 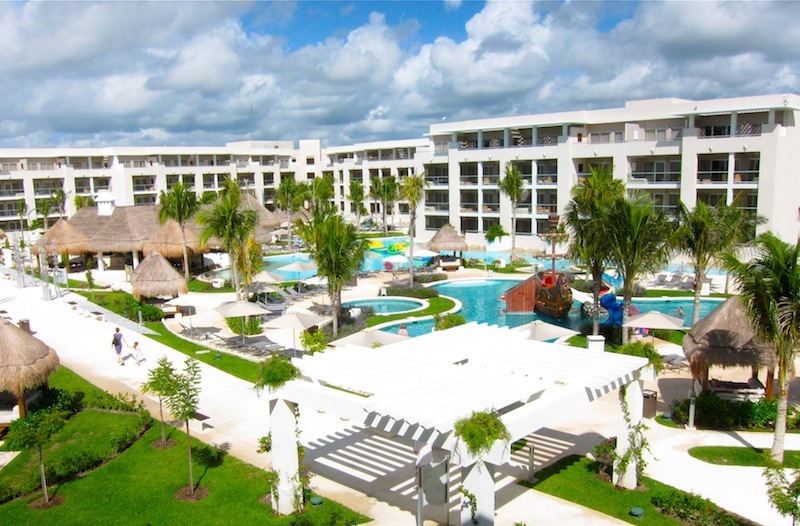 Both resorts are all-inclusives located near Playa Del Carmen, about a 40-minute drive from the Cancun Airport. And both are similar in makeup, offering a top-notch spa, a shop, convention facilities and multiple pools, restaurants and bars. Although the resorts share similar traits, they differ significantly in style and attitude. 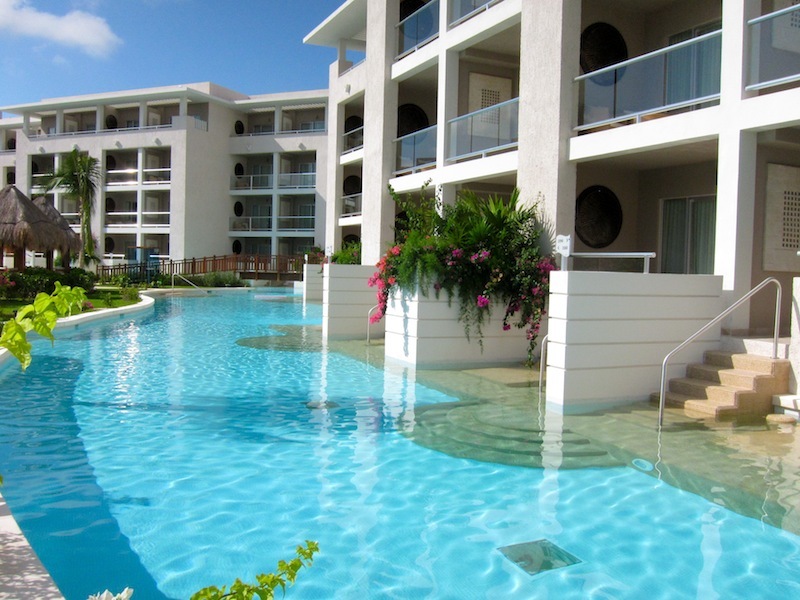 Let me tell you about PARADISUS PLAYA DEL CARMEN first. 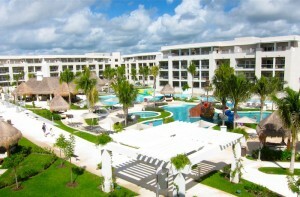 It’s the newest and largest kid on the Maya Riviera block, opening November 2011 with 904 rooms. The property, which is separated from the beach by a mangrove forest, spreads over three sections: La Perla (for adults only), La Esmeralda, (welcomes families) and El Zocalo, a common area between the two sections holding restaurants, bars, spa, conference center and reception areas. Décor is so dramatic it could have been created by a Hollywood set designer with a touch of attention deficit disorder and a taste towards the spectacular. Although some areas are light, bright blue/white and otherwise Caribbean cool, others are dark and theatrical with black, brown, red and purple color schemes and over-the-top lighting fixtures, sculpture and wall treatments. 1. The “swim up” pool that wraps around the terrace of most of the first floor suites. 2. The foliage packed inner courtyards, located between every 100 rooms, and the plantings and water elements in public areas that bring nature into the drama. 3. The over 400 large, coffee-table books that are placed in reception areas for guests to borrow. 5. La Esmeralda’s Family Concierge section, which, without sacrificing adult pleasures, focuses on kids. Kid based delights include not only activities and play rooms, but also amenities in suites, toys in the pool-side restaurant and treats such as a chocolate fountain in the reception area (activated each afternoon at tea time) and snow-cone machine at the pool. The whole scene makes me wish I had a young children to join my vacation—or even better—makes me wish I were a kid in a family lucky enough to find this resort. 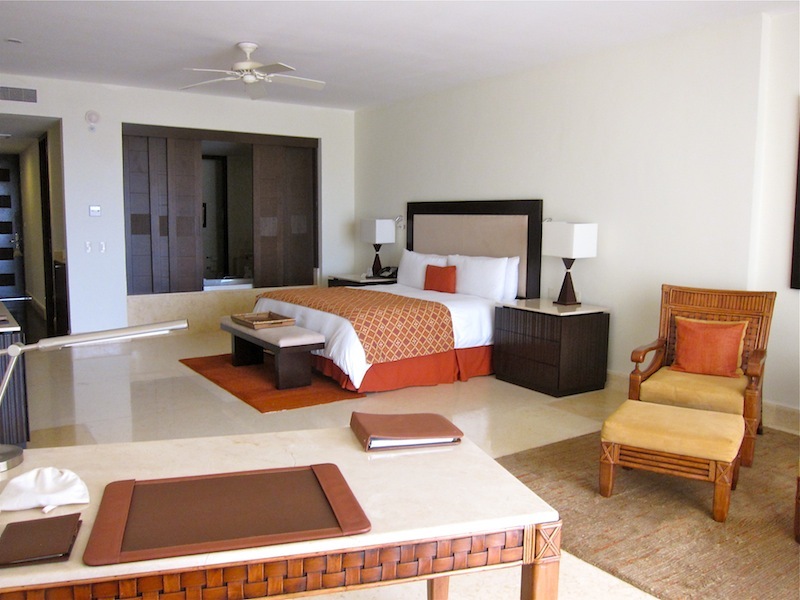 Whereas words used to describe Paradisus include lively, pizzazzy dramatic and upbeat, words to describe the GRAND VELAS RIVIERA MAYA involve elegant, peaceful, gorgeous and luxurious.Tag line for the AAA Five-Diamond Grand Velas reads,” Beyond All-inclusive. Beyond All Compare.” And the marketers got it right. Set on over 80 acres, the four-year old property offers an oasis of man-made beauty in a glorious natural setting that incorporates mangrove forests, jungle, and over 1,000 feet of pure white sand beach. The 491 suites fall into different categories and spread over different sections: the Zen Grand (near the convention center in the midst of lush vegetation), the Ambassador (surrounding the resorts main infinity pool overlooking the Caribbean) and the Exclusive Grand Class (ocean-front, private terraces and plunge pools). Open-air construction, landscaping and decor enhance the natural, with the resort’s basic beach-white and thatch-tan colors the perfect background for bold accents supplied by embankments of pink bougainvillea cascading over terraces, luxuriant greenery lining walking paths and dazzling blues of the pools and the sea. 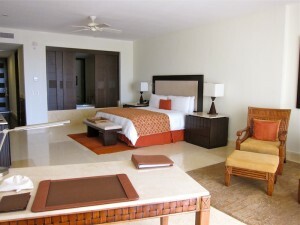 Of course, spacious suites pack in the amenities, including walk in closets, extra large bathrooms (Jacuzzi tub, separate rainforest-head shower, dual sinks) and graceful terraces. 1. The spa, with its hydrotherapy circuit. 2. The nature-gone-wild setting surrounding the resort and the restrained and cultivated landscaping within the resort. 3. The general gentle and genteel ambiance. 4. 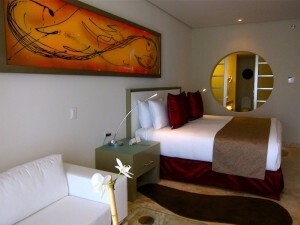 The three-to-one staff-to-guest room ratio providing super service. 5. Cocina de Autor, the resort’s signature restaurant. 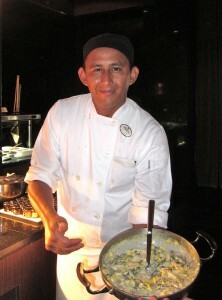 Although the property’s seven other restaurants tempt guests with a variety of cuisines including Mexican, Asian, Italian and French, Cocina de Autor serves inventive, creative dishes that dabble with the molecular and are so unique as to defy description. 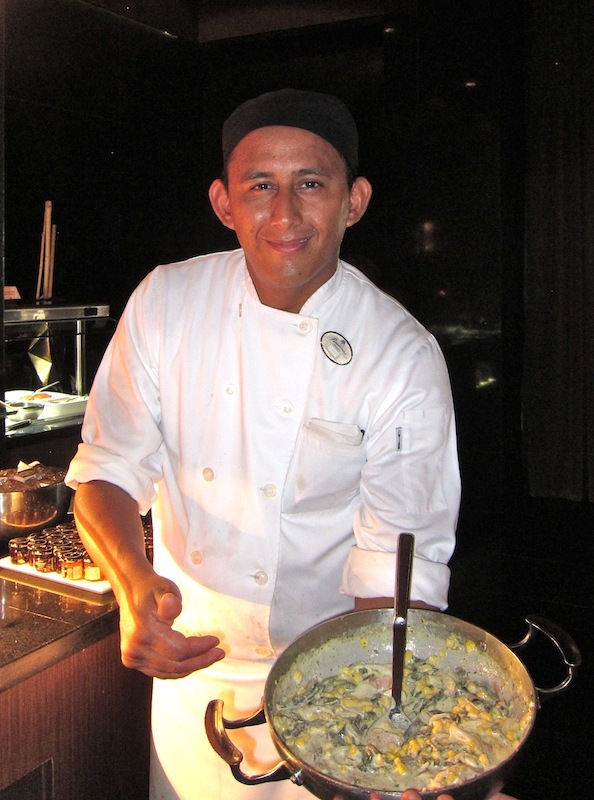 I’d stay at Grand Velas just to eat at Cocina de Autor. And while on the subject of good food, let’s get back to the recipe from Paradisus. Although the resort serves Rajas Poblanas Con Elote on its breakfast buffet—and the dish is wonderful with breakfast foods—the rich sweetness of poblanos mixed with corn and cream provide a perfect accompaniment for barbecues, grills and roasts. Char the poblano peppers over a gas flame or under a broiler. Enclose blackened peppers in a plastic bag and let steam for 10 minutes. Peel and seed peppers and cut into1/4-inch wide strips. Peel and slice onion into 1/4-inch wide strips. Put oil in a large heavy skillet set over medium heat. When oil is hot, add the onion and sauté, stirring often, until translucent, about 5 minutes. Add the corn and garlic and sauté, stirring often, an additional 2 minutes. 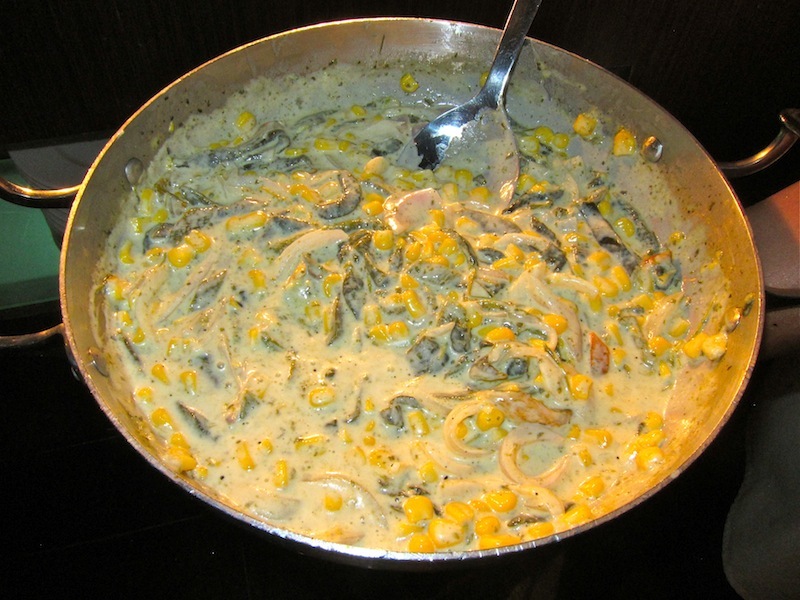 Add the poblano strips and enough Mexican crema and to cover ingredients. Sprinkle as desired with salt and pepper. Bring crema to a simmer. 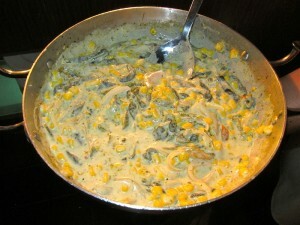 Simmer, stirring often, until corn is cooked, sauce thickens and flavors blend, about 8 minutes. Thin sauce with cream if necessary.